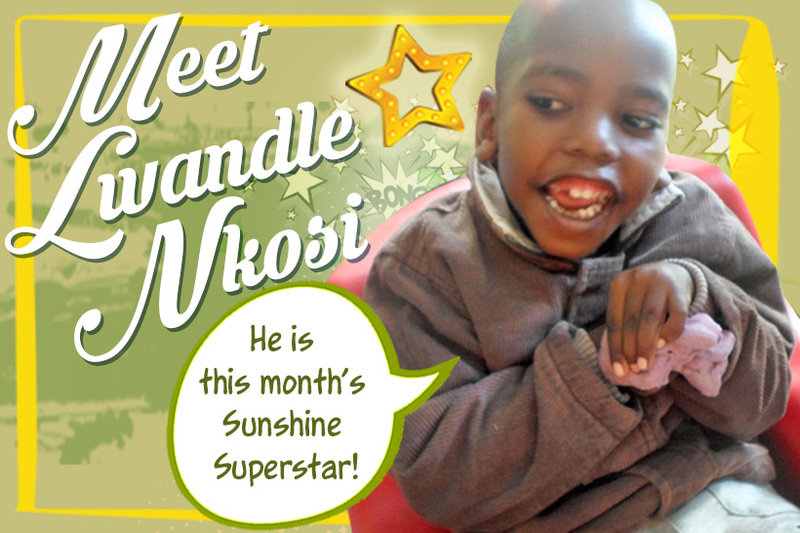 Our Sunshine Superstar of the week is a boy who has made such great progress, in a very short amount of time. Lwandle Nkosi will turn five in July this year. He is a young boy with cerebral palsy who started attending the Stimulation Two Bunny Class in May 2016. In the space of just three weeks, Lwandle has already managed to make his teacher feel extremely proud of his improvement. Cerebral palsy comes in many different forms, and what makes it more confusing is that no two cases are exactly the same. The main categories of cerebral palsy are spastic, athetoid and ataxic. Spastic cerebral palsy is the most common form but people can also have a mixture of different categories. Because Lwandle’s cerebral palsy has prevented him from being able to hold or squeeze anything, his teacher began by giving him stimulation exercises using graded textures to feel and tactile balls to squeeze. In his first month at the Sunshine Centre, he managed to squeeze play-dough using both hands. He put the play-dough on top of his right hand, which is spastic, and using his left hand he pressed the play-dough and squeezed it. It’s a small but very encouraging start for Lwandle, and it was amazing for his teacher to witness. His progress is so encouraging and he can be very proud of himself. Well done Lwandle!